Sunroom after lighting improvements. Lights from Kichler, fan from Casablanca. Shade solutions from Hunter Douglas. This is a space we really had zero long-term plans for upon moving my parents in. We haven't used it much thus far, and considering the amount of projects and work to accomplish everywhere else, it really hasn't been an area of focus. Late last fall we invested in having the room stabilized, as it was shifting, causing cracks in the drywall and difficult operation of doors and windows. With that issue resolved, I've been getting increasingly eager to dig into this space and figure out what its purpose is. It's kind of a great starting point, since like the bathroom, it's a contained unit that we can work on a little more easily. The room before, emptied and ready for improvement. As is, it's always kind of just been an aesthetic room. We kept all the wicker furniture that's always been there, which looks nice, but it's awfully uncomfortable to actually utilize. I've been reevaluating what we can really do out here. With all the windows, and now new, functional shades that allow you to actually see outside, there's an amazing view and tons of natural light during the day. We'd love to get my mom out there where she can watch tv and read the newspaper, and take in the most incredible view this house offers. With all the sun, it's often warm in this room as well. My mom is always cold, so this is the ideal room for her to be spending time in. My dad and I love the space, but there's no comfortable seating to enjoy and there's been no tv, so there hasn't been any good purpose to the space. It sounds kind of awful to be centered on a tv, but in this day and age the 'sitting room' concept is kind of out. We all need flexibility in multiple spaces for individual tv viewing habits. In the long run, we're looking at implementing some sort of table surface that my mom can use, and a couple of different furniture pieces that offer better seating options specifically for us, along with the tv. There's too much furniture in there as it is, we need to pare it down so that my mom can get around and utilize the space. Most of the wicker will likely be sold off, a little bit sad since it's always been there, but a more functional room awaits beyond that barrier. View toward the other direction with exterior patio access. Filling the cracks in the wall from when the room shifted was really the first thing I got into here. They'll be visible until painted, but they're less prevalent after being filled and it at least looks like a step in the right direction. Paint is a little ways off still, we'll save it for a future post. 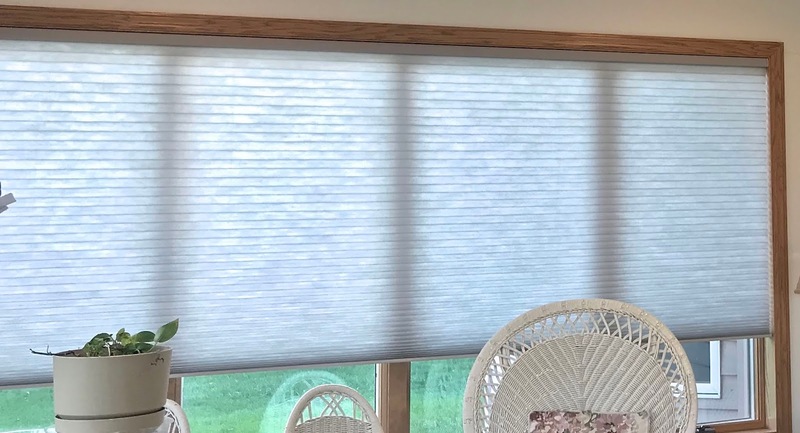 Right around the time I filled those cracks, we'd started talking with a Hunter Douglas dealer about all the shade options for the house. I knew that the ideal choice for this space would be motorized shades, so that they could be scheduled to operate on their own and have potential of voice activation through Amazon Echo for my mom to utilize. Originally I had a vision of roller style shades for a slightly more contemporary vibe, but the designer talked us into a more traditional pleated style shade that provided more insulation value at much lower cost. I think it was definitely the right choice. The light grayish color is still lightly contemporary, but the TRUE beauty of these shades is how low profile they are when fully open. It entirely maximizes the view that the windows offer and provides a very sleek appearance. It's still modern without going sterile, as our designer pointed out. We are loving the benefits of PowerView Motorization. The blinds go up by themselves in the morning and down at sunset, and in-between I set them to change a couple times to block out some of the afternoon sun that makes this room feel a little too much like a sauna. The difference is tremendous, you can feel the change almost immediately. It's just wonderful that everything is automatic, especially when my mom is not able to operate traditional blinds. Motorized shades by Hunter Douglas. With things slowly progressing in this room, I'd been thinking about lighting in this space more and more. This room only had switched outlets for lamps originally. I hung a ceiling fan with a swag kit where a previous light had hung, but I really wanted a proper ceiling box location for it, along with some actual ceiling lighting to boost the output. This room is bright during the day, but turns into a cave after the sun goes down. With my parents starting to deal with aging eyes, a few lamps were just not going to be enough. Once again I've returned to Kichler for my favorite LED discs, however I was DEVASTATED to learn that the old generation is being discontinued, and the new ones are looking to be more costly. I'd still absolutely recommend any Kichler product despite any price point, but I am disappointed that such a great value will no longer be available. Regardless, I was still able to obtain a few for the purpose of outfitting this space. Once again, like the bathroom project, adding this type of electrical infrastructure is not really a DIY thing. Find yourself a good electrician to do this stuff for you, they'll get it done in a timely manner and make sure everything is done right! Shop the latest Kichler LEDs by clicking here. As always, initial layout is key. I was presented with an unfortunate obstacle in laying out the switch boxes. The framing in this little wall was not conducive to a double gang box, so I had to stack the fan's switch above the added dimmer switch for the lights. We wanted to retain the switched outlets for convenience, so I was determined not to disturb the existing switch location. It wouldn't have fit a two gang either, I did check to be sure there wasn't a cleaner way to go about this. It ended up with the best solution I could do. The lighting layout was done with one light in each corner, a few feet out from either wall. We did fewer lights, anticipating future utilization of a fan with a light kit to even out the distribution in the center of the space. After adding all the lighting infrastructure and working in the wall, the final step of making up the fan box was a piece of cake. 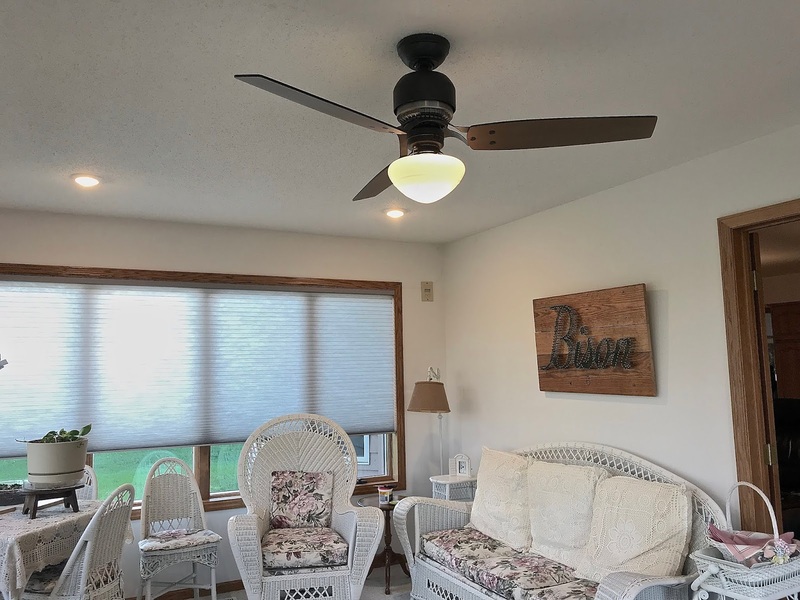 I utilized a typical fan rated expandable bracket to span the joists and get the fan directly on center in the room, making sure it was a kit capable of supporting 70 pounds in ceiling fan weight, as I do everywhere in case I want to hang cast iron Hunter Original fans, as was previously hanging in this room. Adjusting the switch layout after discovering a two gang would not fit. 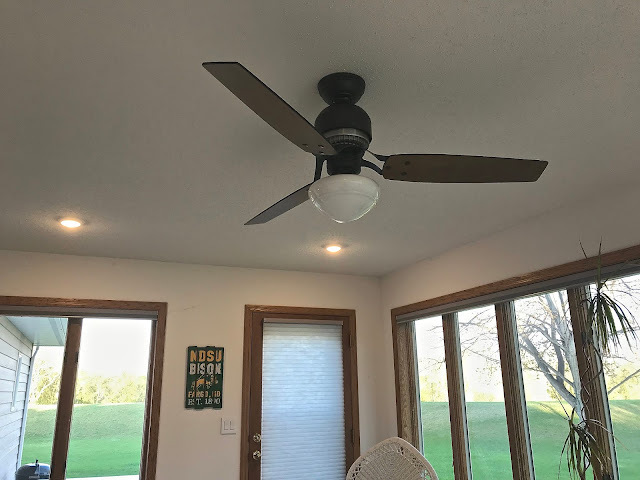 Relocating the ceiling fan to center of the room. Fan going back up. Waiting on lights to arrive. On the day I did all this work, I was kind of spent by the end of the day and had simply started putting the same fan back up, too tired to really think about choosing another option. Another week later I was thinking more about it, and once the Kichler lights arrived, I decided I really wanted to do a fan with a light kit to see what full light distribution in the room would be like. For the Hunter Original, I didn't have any good means of controlling a light. 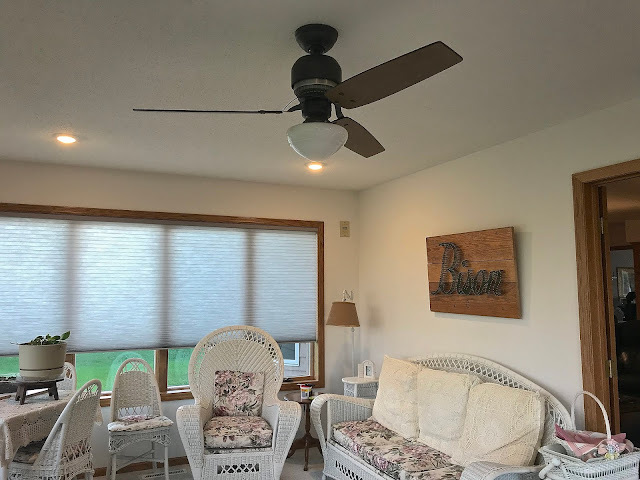 Mostly, though, I wanted to use Hunter's SIMPLEconnect bluetooth control on something so that the fan could control itself daily along with the blinds in order to help stir up a breeze in a room that gets a little stale and warm. In the end, I chose an option that would lend itself a little to the future vision of this room. A modern neutral-based color palette, perhaps light industrial vibes in some regards, an essence of reclaimed wood. Casablanca's Tribeca fan in aged steel was the perfect answer. Shop the Tribeca in this finish here. Tribeca fan in aged steel from Casablanca Fan Company. Light kit from Hunter Fan Company. Now, this is likely not going to be the 'permanent' fan. There is possibility of a surprise up my sleeve, this is part of why I wanted to see what kind of output a fan light kit would contribute, but I can't say anything further in that regard until we progress along further. What I will say is, it may not be the last Casablanca fan to live in this location. Do with that information as you will. For the moment, I'm very happy with how it looks and am eager to see how this room progresses. With that, I'll say goodbye for now here, but please continue scrolling down to see more images of the final (for now) results. See you next time!